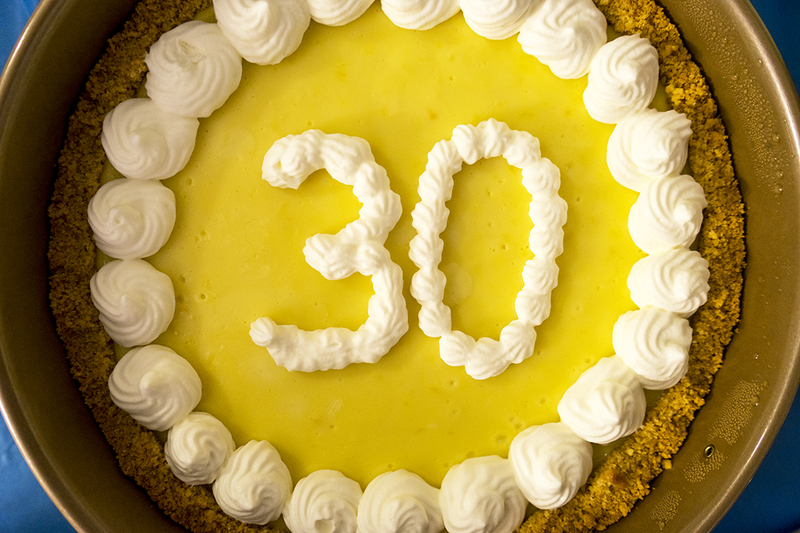 A friend’s 30th birthday called for a special birthday pie, and I was told he loved lemon, berries and nuts. This icebox pie seemed just the ticket, not only because it involves lemon but crucially because I could make it in advance the previous night (I satisfied the love for berries and nuts by making the blueberry sour cream pie). Preheat the oven to 325°F. For the crust, place graham crackers (broken into small pieces) into a food processor and process along with sugar and salt. Pulse until the crumbs are semi-fine (not powdery). Pour in melted butter and pulse until the butter is blended and the mixture holds together. Pour crust mixture into a 9″ springform pan and, with the bottom of a measuring cup or round glass, press the crumb mixture onto the bottom and two-thirds of the way up the sides of the pan. Set aside. For the filling, whisk condensed milk and lemon juice together in a small bowl and set aside. Whisk lemon zest and egg yolks in a medium bowl until pale. Then whisk together with the lemon juice-condensed milk mixture. Pour the filling into the crust and bake until the center jiggles slightly, about 25 minutes. Remove from oven and cool for 1 hour on a rack. Loosely cover the pan with plastic wrap and freeze for at least 6 hours or overnight. Before serving, pour heavy cream into the bowl of a stand mixer. Add vanilla and sift in confectioners’ sugar. Beat at low speed to combine and then increase the speed to medium-high. Beat until medium-stiff peaks form. Using a pastry bag (or a ziploc bag with a tip cut off) and fill with chantilly cream. Decorate top of pie as desired. Serve immediately or keep in the freezer for up to 1 week. The pie was a hit! It was just the right combination of tart and sweet (airing more on the tart side, but offset by the sweetness of the chantilly cream). It was a bit arduous to get the crust to stay up on the sides, so I might consider using a traditional pie plate next time. All in all, I think the birthday boy was a happy camper, so I’ll call it a win.